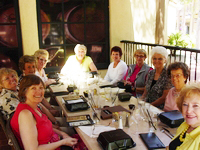 The Lunch Bunch meets the 3rd Thursday of every month and car pools from the San Vicente Golf Resort. We choose different ethnic restaurants or any restaurant that someone has tried and suggested. We usually try to sit at one table and have a topic to discuss. We welcome all members to join us and bring your appetite. You can sign up at the monthly meetings or by calling Jean Scofield at (909) 557-5996.